Crystal Palace's push towards the Premier League's top four stalled as a much-changed Swansea side ground out a point at Selhurst Park. Swans caretaker boss Alan Curtis saw his side secure a third clean sheet in a row to remain above the bottom three. Palace defender Brede Hangeland's flicked header early in the second half was well saved by Lukasz Fabianski, who later denied Patrick Bamford. Gylfi Sigurdsson almost won it for Swansea, but his free-kick was saved. Palace had moved to within reach of the Champions League qualification places by scoring nine goals in their four matches before Christmas. Alan Pardew's side, though, have been held to goalless draws in each of their two festive fixtures so far. Pardew gave Marouane Chamakh his first start of the season, with the former Arsenal striker bidding to regain full match fitness after a thigh problem. Chamakh, though, made little impact, with Palace's best chances coming once Bamford came on as a half-time substitute. Bamford, on loan from Chelsea, had Palace's clearest opening, but shot straight at Fabianski after James McArthur's pass had ricocheted into his path. The biggest disappointment for Pardew, though, was a soft first-half yellow card for winger Yohan Cabaye, who will be suspended for next weekend's Premier League meeting with Chelsea. Curtis made eight changes to the side that beat West Brom 1-0 on Boxing Day in an attempt to keep his players fresh. His line-up included three men - centre-back Jordi Amat, midfielder Matt Grimes and forward Marvin Emnes - who had not played a single minute of Premier League football all season. It was one of the three players who retained his place who proved the key, though, with captain Ashley Williams outstanding in central defence. Curtis' side restricted Palace to just two shots on target, and almost snatched a second 1-0 win in three days, with home keeper Wayne Hennessey getting across well to push aside Sigurdsson's stoppage-time free-kick. Crystal Palace manager Alan Pardew: "I just thought it was a poor decision to book Cabaye. We've lost him for a key game. Fans pay a lot of money to see players like that, and the referee's taken him out of the game. "A mistimed challenge is not a yellow card. It's a deliberate tackle to stop someone progressing down the pitch. Brede Hangeland escapes a booking for a far worse challenge. "We want great players on the pitch. Stop handing out yellow cards." Swansea caretaker manager Alan Curtis: "It was an excellent point against a very good Crystal Palace team. They showed today why they are where they are in the table. "We're unbeaten in three with three clean sheets. That's a huge improvement on where we've been of late. "I thought Ashley was brilliant. He's been the rock of the side for any number of seasons. Ashley epitomised the spirit of the team." Crystal Palace have won one of their last nine league matches against Swansea (W1 D4 L4). Swansea have conceded just three goals in those nine meetings. Palace's run of six league games without defeat is their best in the top flight since April 1993. Swansea have managed victory in just one of their last 11 Premier League trips to London (W1 D3 L7). The Swans have won just one away league game all season, at Aston Villa on 24 October. Crystal Palace have not won their final league game of a calendar year since 2011. Match ends, Crystal Palace 0, Swansea City 0. Second Half ends, Crystal Palace 0, Swansea City 0. Offside, Crystal Palace. Brede Hangeland tries a through ball, but Mile Jedinak is caught offside. Corner, Crystal Palace. Conceded by Kyle Naughton. Attempt saved. Gylfi Sigurdsson (Swansea City) right footed shot from outside the box is saved in the bottom right corner. 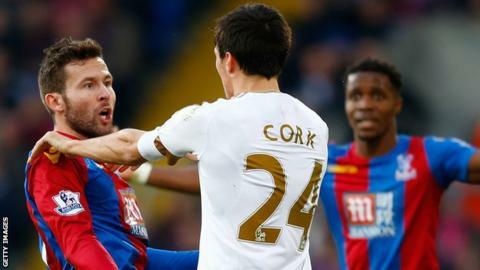 Brede Hangeland (Crystal Palace) is shown the yellow card for a bad foul. Foul by Brede Hangeland (Crystal Palace). Attempt saved. Gylfi Sigurdsson (Swansea City) left footed shot from outside the box is saved in the bottom left corner. Assisted by Matt Grimes. Attempt missed. Wilfried Zaha (Crystal Palace) right footed shot from the left side of the box is close, but misses to the right. Assisted by Yohan Cabaye. Corner, Crystal Palace. Conceded by Ashley Williams. Corner, Crystal Palace. Conceded by Ki Sung-yueng. Attempt missed. Jordon Mutch (Crystal Palace) right footed shot from outside the box misses to the right. Assisted by Mile Jedinak. Corner, Crystal Palace. Conceded by Neil Taylor. Substitution, Swansea City. Kyle Bartley replaces Jordi Amat because of an injury. Substitution, Crystal Palace. Jordon Mutch replaces James McArthur. Foul by Lee Chung-yong (Crystal Palace). Attempt saved. Patrick Bamford (Crystal Palace) right footed shot from the centre of the box is saved in the centre of the goal. Offside, Swansea City. Jack Cork tries a through ball, but Bafétimbi Gomis is caught offside. Substitution, Crystal Palace. Lee Chung-yong replaces Jason Puncheon. Neil Taylor (Swansea City) wins a free kick on the left wing. Ki Sung-yueng (Swansea City) is shown the yellow card. Corner, Swansea City. Conceded by Joel Ward. Corner, Swansea City. Conceded by Wayne Hennessey. Attempt saved. Modou Barrow (Swansea City) left footed shot from outside the box is saved in the top centre of the goal. Assisted by Kyle Naughton.